This book explains the motivations for building and using portfolio tools, and clarifies the principles and practice of using and developing them for assessment, recording personal information, self-presentation, personal and professional development, and for subtler and deeper aims of encouraging a reflective approach to learning, practice and life, developing personal identity, and ethical development towards moral agency. The book also offers a stimulating future vision to orient those with a longer-term perspective on the directions in which portfolio tools and related technology are advancing. 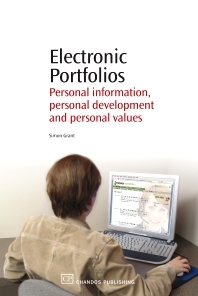 Part 1 Principles of e-portfolio systems: Some scenarios of e-portfolio use; Who wants personal information? The rationale behind recording and storing personal information; Portfolio purposes outlined; Portfolio information; Issues with portfolio information; The need for common terms in portfolio information; Portfolio functionality; Applying e-portfolio principles. Part 2 How to do things with e-portfolio and related tools: How to use tools for assessment; How to use tools for recording significant personal information; How to use tools for self-presentation; How to use tools provided for your own development; How to motivate and help others to use tools; How to develop e-portfolio tools; How to coordinate e-portfolio and administrative tools; How to develop interoperability in tools; How to publish terms for common use by tools. Part 3 Future vision: Notes on portfolio environments and values; Matching information for people; Personal values, identity and personality; Developing personality and personal values; Ethical development and values in society; The culture of information and choice: An analogy with the development of agriculture; In conclusion? Simon Grant has researched in cognitive science, taught and trained in universities and schools, run his own business, and is now a freelance consultant specialising in e portfolio systems and interoperability. For over ten years he has been closely involved in the e portfolio field, with many projects in the areas of lifelong learning, personal development planning, e-portfolios, and skills, and has played a vital role in the UK and European standards communities in these areas. For several years he has helped to run the JISC CETIS (Joint Information Systems Committee; Centre for Educational Technology & Interoperability Standards) Portfolio community of practice, bringing together portfolio practitioners and developers. Along with his wife, Anna, he has a live interest in ethical development, personal values, and personal identity. They are planning to apply their insights directly to the world of business.